An interesting infographic developed by an insurer presents an in-depth look at the cost of trip, slip and fall accidents in American industry. Slip and fall accidents leave 9 million people with injuries serious enough to send them to the hospital each year. 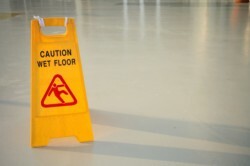 Slip and fall accidents are among the most frequent on-the-job accidents, accounting for 35% of all workplace accidents. They are a leading cause of claims for workers’ compensation benefits, costing insurers and employers $70 billion in compensation and medical costs, or about $20,000 per accident. Slip and fall accidents also lead to 95 million lost work days every year, with an average of 38 days lost per fall accident. The most common work-related injuries from slip and fall accidents are fractures, seen in 5% of slip and fall accidents. Slips and falls are also some of the most preventable workplace accidents. Frequent factors in slip and fall accidents are lack of access to training in fall prevention, lack of appropriate footwear, inappropriate walking surfaces and failure to include hazard warnings. If you are an employer, it pays to help keep your workplace slip and fall-proof and, as importantly, dry. Wet walking surfaces are a factor in approximately 55% of all the slip and fall accidents reported in the workplace every year.